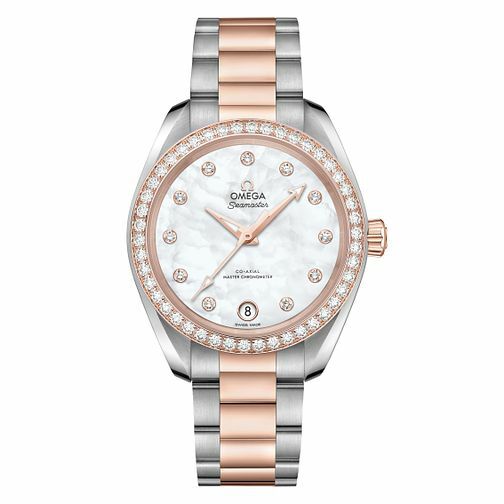 Omega crafts an incredible masterpiece in modern watch design, with a vertical colour accent made in luxurious 18ct rose gold that also surrounds the bezel and crown. Precious diamonds have been set into the bezel and into the dial that add an unmistakeable sense of sparkle that will not go unnoticed. As part of their tradition in maintaining the highest sense of precision, this watch is also certified as a Master Chronometer which allows it for higher levels of magnetic resistance, making it both stylish and accurate even in adverse conditions. Swiss-made for decades of experience in the tradition of watchmaking.